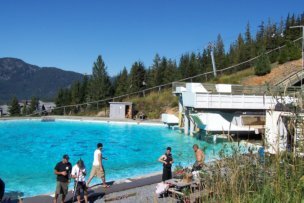 Say Whistler and most people think of winter. 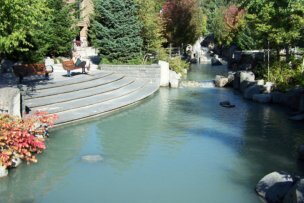 But Whistler summer, spring and fall are absolutely beautiful. 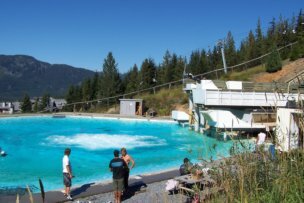 Activities range from golfing on 3 major 18 hole courses; to hiking in the high alpine; less strenuous trails at lower elevations including near the village; hikes of varying degrees of challenge in the area; touring the 2010 Olympic sites; watching ski acrobats practice off their summer jump into the pool; and even late season skiing on the Blackcomb glacier. Village activities include something for all ages. "Shop till you Drop" is a favourite for some. 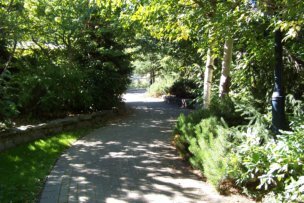 And it takes place along these beautiful pedestrian walks. 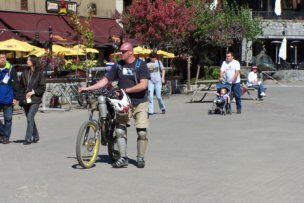 Here you will see folks wheeling kids in strollers, coming back from or going hiking, downhill biking and SHOPPING to their heart's content.There are beer gardens and path-side pubs mixed in with the shopping giving the village a feel of the freedom of Europe. 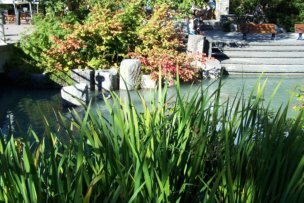 Or maybe you want to sit and relax, or spend the day reading beside a stream in the village. Maybe you prefer this quiet pool. A village path might attract you. Maybe this one will encourage you to wander on a bit. Let's stay down in the valley for now. 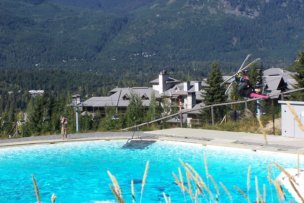 Golf is a big activity during Whistler summer, fall or spring. You can pick and choose between four major, high quality courses. Want one designed by Jack Nicklaus? Try Nicklaus North . Some prefer an Arnold Palmer course like the Whistler Golf Club. 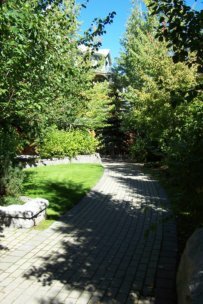 The third course located within Whistler village is the Chateau Whistler Golf Course. Starting to get the picture? 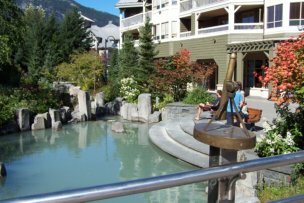 There is a lot to do in a Whistler summer, fall or spring. It's not only about skiing. And there's still more. A quick 25 km away is a course with great views. 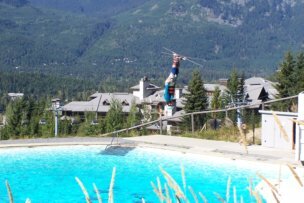 Nestled in a wide valley, that is also the locale for hang-gliding and para-gliding is the Big Sky Golf and Country Club. 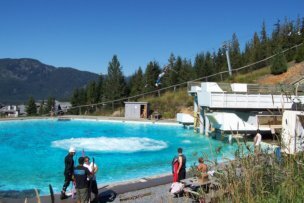 In fact you'll be passing several golf courses on your drive up to Whistler from Vancouver. 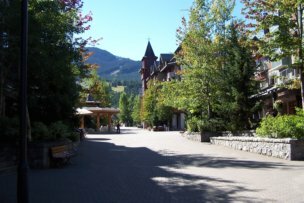 Don't get diverted - keep going to the rewards of Whistler. 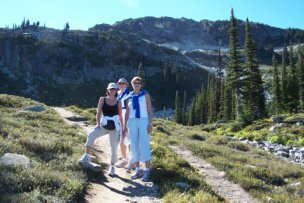 One of our favourite activities in a Whistler summer, fall or spring is hiking the trails in the alpine on Whistler Mountain. 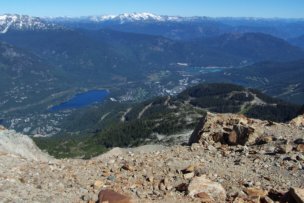 You can save your energy for hiking on top by taking the gondola from the village to the top of Whistler. 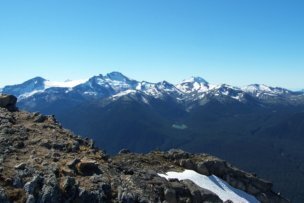 There you'll see breathtaking views like this perspective on the top of the world with the monolothic Black Tusk in the distance (another excellent climb that takes a long day from parking lot to Black Tusk and back). 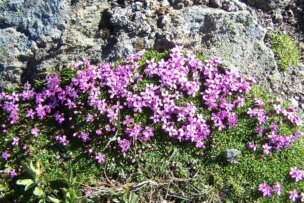 Alpine flowers like these beauties are only out in mid to late summer after the snow has melted and sunlight during the day provides enough warming. There are some excellent alpine circuits of a few hours duration. We can do these with ease and we're in our mid to late 60's. So if you're younger you can certainly do these and some longer ones that we still do. 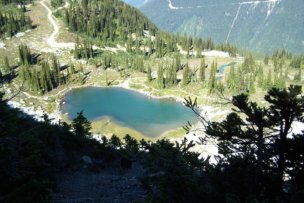 A small lake in the alpine provides a summer water source for wildlife. 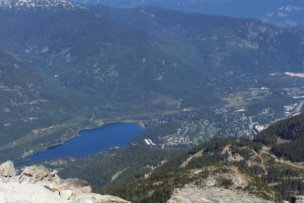 This breathtaking view looks down on a Whistler summer showing the village, the valley and the lakes. 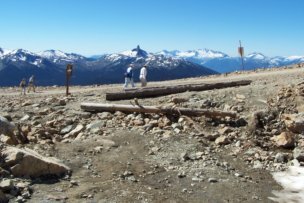 At some parts of the peak of Whistler Mountain there can be snow throughout the year depending on the snow depth, amount of sunlight in spring and summer, overnight temperatures etc. 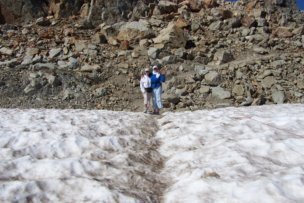 Hard enough to walk on, the snow encourages trail blazers. 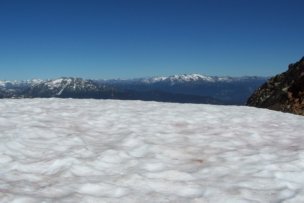 Care is needed to ensure that the area under the snow is flat and that no run-off streams are under the snow. One more view of the top and let's head back down the mountain. There is spring skiing on the Blackcomb Glacier, with lifts carrying you up from Whistler Village. This can run into June and July some years. 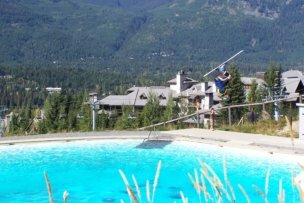 But an interesting variety of summer skiing is ski acrobat training. 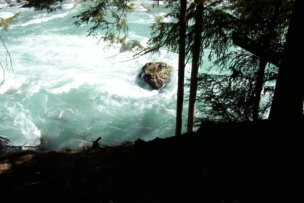 Nairn Falls is about 10 km north of Whistler enroute to Pemberton. At the Nairn Falls Pronvincial Campsite there is free parking near the start of the 1.5 km trail to the Falls. 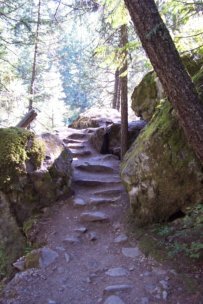 this well graded and maintained trail borders the rushing waters of the river far below and leads you to the beauty and mystery of Nairn Falls.